I met Candy Ramirez, Queen Bee Baker, about a year-and-a-half ago through my friend, Nely Galan. Nely has this way of bringing like-minded people together. And this pairing changed my life! Candy is the baker’s version of what I do – and ten fold! (Love that pun!) She has blended a career in the baking arts, first as a custom cake designer for clients far and wide, and now she has evolved her brand to teach, mentor, and share confectionary ideas for people to create at home. Seriously, if you are running your own business – full time or as a side hustle, you need to follow all her feeds. She does daily vlogs where she shares ideas, thoughts, and tips on life, family, the biz – and baking of course! 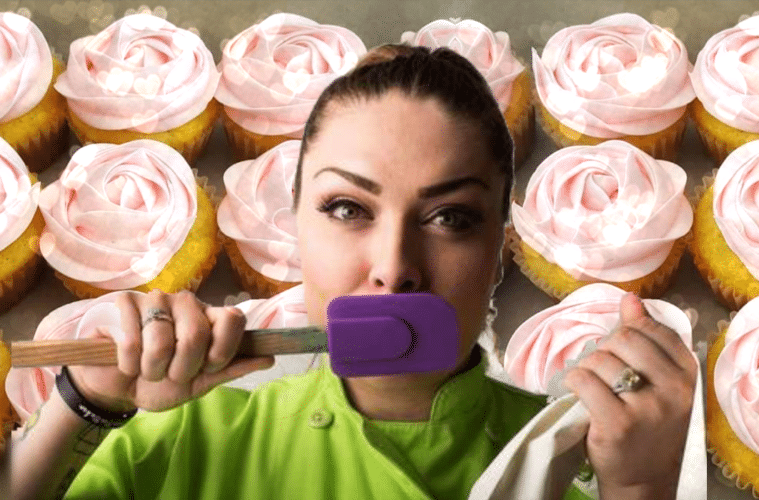 Check out my podcast interview with her, and then I’ll put together another post with her epic cake ideas. They will blow your mind! and check out my Facebook page on Friday, we’ll be doing a Facebook Live where she is going to teach me how to flip a cake! The Crafty Chica Show podcast is available on iTunes, Spotify and a lot of other outlets, please subscribe, comment and share! And let me know what topics you would like me to cover! Here is a rundown of my interview with Candy! 1:20: Candy tells the story of how she started baking as a child with her great-grandmother. 4:35 Candy talks about going pro – and how she started by making and passing out free cake pops at Walmart to promote her business! 17:54 The moment that changed Candy’s life, and made her up her game. 22:49 Candy talks about being on the TV show, Cake Wars! 28:32 Candy shares tips for people who want to bake and sell cakes out of their home. 32:38 Cake decorating and baking tips! AWESOME tips for frosting/buttercream/cake flips! 40: Expectations, making sure your mind, body, and spirit are aligned to run your business. How to Make Marshmallow Unicorn Pops!